Beats, the company that Apple acquired back in May 2014 for a whopping $3 billion, has just announced a new Bluetooth speaker, its first under Apple's umbrella. Called the Beats Pill+, the speaker replaces the Beats Pill and will be available for purchase this November at a price of $229.99. In terms of size, the Beats Pill+ is larger than its direct predecessor, but smaller than the Pill XL, the Bluetooth speaker that Apple discontinued back in June after recalling units due to overheating batteries. Like previous Beats Pill models, the Pill+ comes with a pair of stereo tweeter speakers placed towards the sides and two centered woofers that take care of the low end of the audio spectrum. As far as the design is concerned, the overall rectangular shape of the speaker has been maintained, although some changes are to be noted as well. First, the power button and volume controls have been moved from the back to the top of the device, which should lead to easier access. Also, the speaker was also flattened a bit, which should help with achieving better stability. The biggest change introduced by the new Beats Pill+ is on the connectivity side, where the Bluetooth speaker switches the connector for the charging input. Instead of the standard microUSB connector, the new Beats Pill+ uses Apple's proprietary Lightning solution. Sure, the box comes with both an adapter and a charging cable, but you won't be able to use older cables, and the message is out there: the Beats Pill+ is an Apple product. Rounding up the connectivity side, the Beats Pill+ also comes with a standard 3.5mm audio connector and a full-sized USB port that you can use to charge other devices from the speaker. According to the manufacturer, the Beats Pill+ lasts for 12 hours of continuous playback, a hefty improvement from the 7-hour battery life of its predecessor. 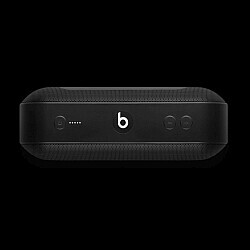 The Beats Pill+ has also inherited the characteristic features of previous Beats Pill speakers, such as the ability to sync two units. Beats has also announced a new Beats Pill+ app, one that will let you manage the speaker from both iOS and Android devices. One particularly interesting feature introduced by the new app is the ability to pair two smartphones to the unit, allowing multiple users to take control of the speaker. What do you guys think of the all-new Beats Pill+? Are you surprised to see that Apple has changed the microUSB charging port to a Lightning one? So from my experience Beats headphones sound horrible for the price. What about their speakers? I do admit that the design is eye catching. I'd still buy something else like the Sony SRS-X33 for almost half the price. I have the SRS-X2 and love it. Beats are overrated and surprising less powerful. Sony is a great buy. The sound for the 2nd generation beats pill was horrible, it was loud, but had no bass whatsoever at volume upwards of 80%. It also distorted like crazy when turn past that volume percentage. For $200 it was terrible; you could have bought the Sony Srs X3 for ~$60 on eBay and it still would annihilate the beats pill. The Pill Xl on the other hand was amazing, if you were looking for bass and sheer volume look no further. The only thing that Beats speakers have going for them were their battery life which was always upwards of 7 hours compared to around 6 for the competition. Get yourself an Ultimate Ear Boom or Boom 2 instead. They are the best portable speakers on the market. I can't swallow dat sh*t when apple puts the plus sign on. $229 on contract with a dongle required to do other stuff, right? So it is just Beats and not Beats by Dre? People still buy Beats stuff? I saw the kid the other day wearing Beats headphone and just had to laugh. Looked like the family was on welfare. UE Megaboom is probably the best bluetooth speaker you can buy IMO. The sound is unreal. The design of this speaker is nice! Definitely something I would buy, but would wait to go and try in store before purchasing. I'm not a gullible sucker for marketing of overpriced mediocrity like this as I always put the effort into finding the best for whatever I'm willing to pay no matter what brand it is.